24 junior golfers took part in a golf tournament to commemorate the completion of The Els Club’s Little Easy Young Athlete Scholarship Programme (LEYAP). 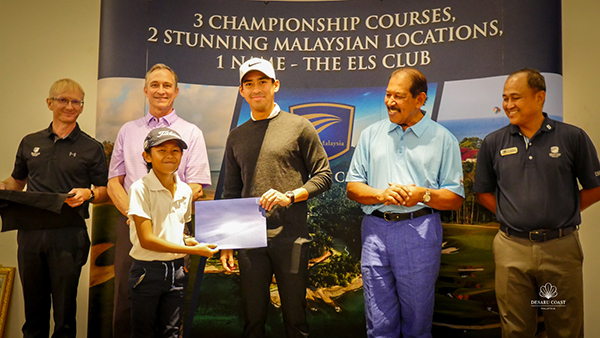 HH The Tunku Panglima of Johor, Tunku Abdul Rahman Al-Haj Ibni Sultan Ibrahim graced the event and presented the prizes to the winners at The Els Club Performance Academy Course. The golf tournament provided an ideal platform for selected junior golfers to apply their knowledge and skills gained from the Little Easy Young Athlete Scholarship Programme. 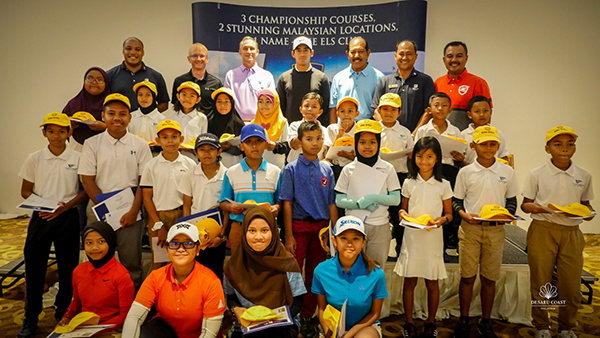 The 24 players, comprising 16 junior golfers from the LEYAP programme and eight Johor junior golfers, were grouped into six flights in the nine-hole tournament played using a shotgun start. LEYAP scholarship programme participants Wafiy Bin Anwar, 16 years old, won the Boys Open Category while Nurul Batreesyah Binti Shahri, 11 years old, won the Girls Open Category. 13-year-old Myra Sofia Binti Mohammad Soffea won the Invitational Open Category. All three winners received their prizes and certificates from Tunku Abdul Rahman. LEYAP was designed to encourage local children to take up the game and benefit from the expertise at The Els Performance Golf Academy (EPGA). 100 primary school students in Johor were selected to take part in the programme that commenced from 2017. Through LEYAP, the junior beginners benefited from eight golf tuition clinics, consisting of eight 90-minute lessons and two months EPGA Practice Access, run by an EPGA golf teaching professional. “We value the importance of sport and the role it plays in society and we are pleased that The Els Club Performance Academy is able to contribute to the development of young golfing talent in Johor. We believe in talent, and the hard work it takes to develop it to its full potential. Through LEYAP, we are able to provide a foundation for keen, young golfers to hone their golf basics and improve their skills,” said Philip Whittaker, Chief Executive Officer – Integrated Theme Parks & Attractions (“ITPA”) of Themed Attractions Resorts & Hotels Sdn Bhd. The LEYAP scholarship programme is a corporate social responsibility initiative developed by The Els Club Performance Academy in Desaru Coast, Johor. LEYAP is designed to enhance the enjoyment of the game for junior players, helping them to develop hand-eye coordination and learn the basics of swing, etiquette and rules of the game. The programme comprises three modules, “Learn”, “Improve” and “Play”. The scholarship programme is based on the foundation module, “Learn”. Created with the aim to increase the uptake of golf amongst the youth in Johor, the scholarship programme is endorsed by the Johor Golf Tourism Association.